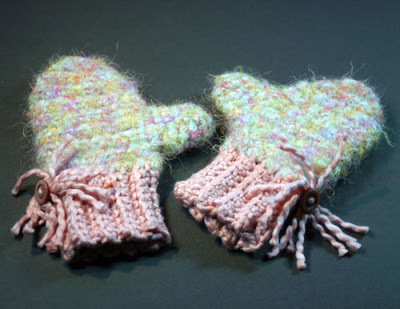 Thank you Janet for including me in one of your Treasuries. Throughout the day there were demonstrations, food, drink, and socializing among old and new friends. 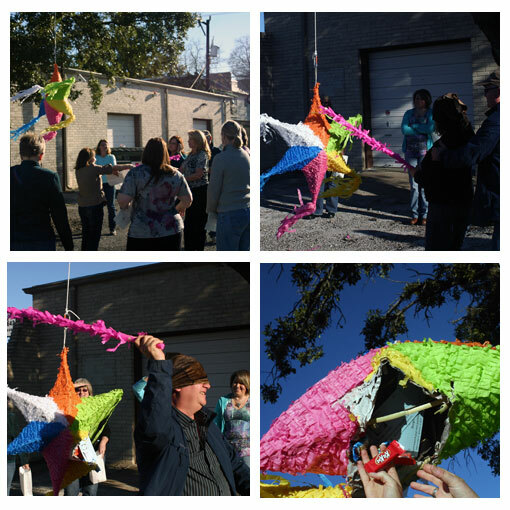 In the late afternoon a crowd gathered to break the pinata. Stuffed with more then just candy. Grown adults elbowed there way for prizes. The last time I hit a Pinata was in elementary school. This was too much fun. 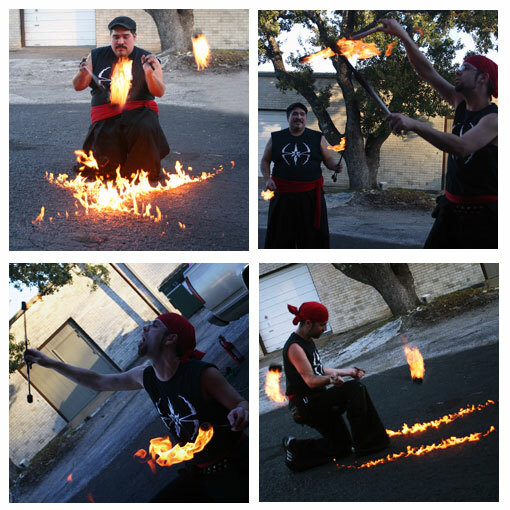 As the evening approached there was a visit from some of the Brothers of the Flame. These guys are just amazing. If you ever have a chance to see them perform you absolutely should. 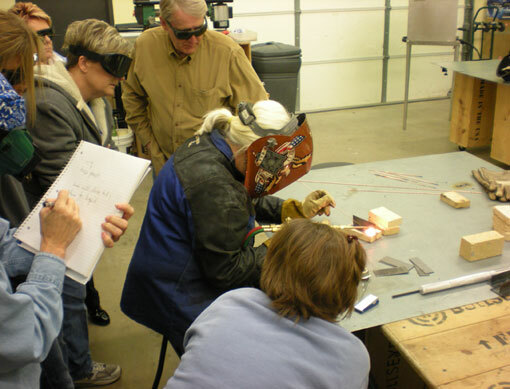 I spent the day at Wired Designs Studio taking an introductory welding workshops. It was a nice change of pace to be taking vs. teaching a workshop at Wired Designs. 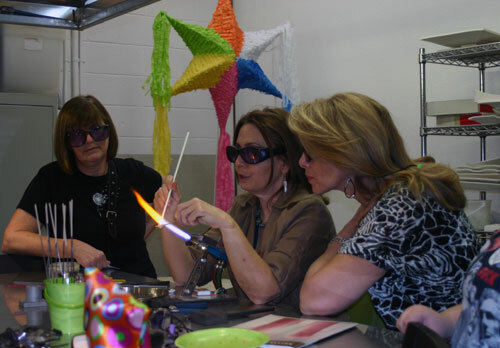 Next Sunday I'll be back at Wired Designs to teach a fused glass workshops on sanblasting iridized glass. 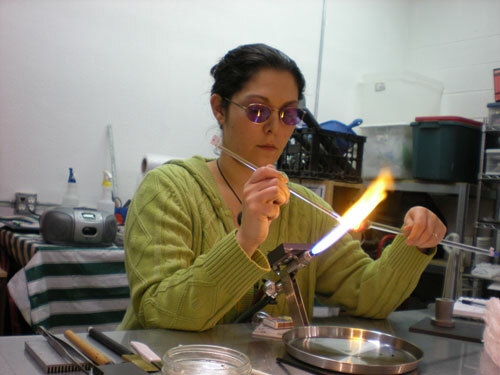 When it comes to flameworking you can't just understand it conceptually you have to be able to execute it physically. I find this terrible frustrating. What! You mean you can't just sit down at the piano and play Chopin! Having made a somewhat focused effort with my time on Firey Fridays, I think I have finally gotten the twisted cane thing down sufficiently to move on. 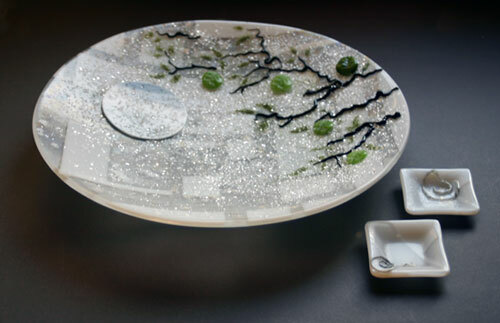 So Sunday I spent time taking a murrini workshop at Dream Fire Glass. I had made simple murrini before but was very pleasantly surprised at how much of a difference this full day of focused instruction made. I think I might actually be getting this heat control thing down. I don't want to get ahead of myself though. 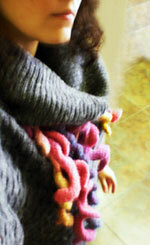 Practice, Practice, Practice... already contemplating murrini making with my time next Fiery Friday. Little by little my hands will learn what my head knows. I just finished reading People of the Book by Geraldine Brooks. This book came very highly recommend from several calligraphy guild friends. They were spot on. People of the Book takes a historic event, the saving of the Sarejevo Haggadah, and tells a fictional tale of the journey this book took from Spain to Sarajevo as it was illustrated, illuminated, and bound. Narrated from the point of a modern day conservator this is 600+ year a tale of intrigue which I would recommend to anyone. For someone with an appreciation for the topics involved you will particularly enjoy the level of description and detail of language which relate to the art and artists who's tales come together in this novel. Call me old fashioned but I still read physical books. My poor paperback copy looks like it went through a cross country journey and survived a few wars itself. I just couldn't put it down so it traveled with me. The pages dog eared and the spine concave from ware. All signs of a well loved book. What a positive sentiment Beata has in compiling this Etsy treasury. I am honored to have been included in such a warm and cheerful collection. On a gray winter day like today it brought me joy to see such bright bold color. I have this habit of buying yarn I like with absolutely no plan at all just because I like it. Later I find myself trying to figure out what to do with a specific amount of something I will never be able to match again. Like the wool I bought from the Sudan Farm. Crazy I know... 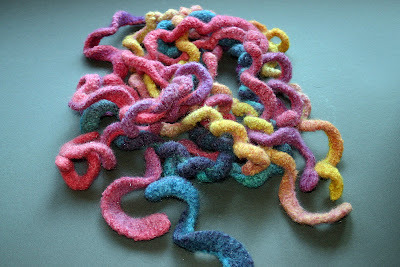 This time when I pulled out a collection of pink, yellow and blue wool which I had bought on one of those whims, I decided to do something just as fun and crazy with it as my idea to buy this yarn had been in the first place. 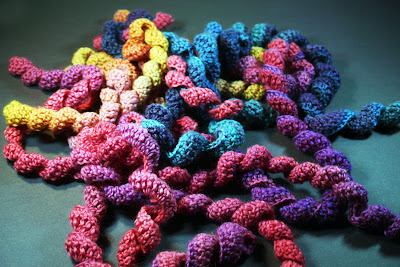 I started by crocheting as many thin spirals (approximately 1 inch wide) in a variety of lengths as my supply allowed. This gave me a pile of Shirley Temple like ringlets. Cute as can be. But I still wasn't really sure what I thought of this idea. So I wore it. No better test then the court of public opinion. I expected to get a comment or two but the consensus was overwhelming. It got complements at work and at the studio. That was expected. These were people who know I crochet and expect this kind of thing from me. It was the complete strangers who stopped me while about my everyday business which convinced me that I might be on to something here. Having worn them I can say from a usability perspective that they are mostly just fashionably fun. They create a nice warmth across the back of your neck, after all they are wool, but I won't wear them with the specific goal for fighting the bitter cold. There are better scarves for that purpose. Also if I make something like this for anyone other then myself I'll need to attach them together somewhere in the back to help keep them together all the time. Won't want one to get lost now would we. Since this is still relatively a new and developing idea, I'd love to know what you think too. Thumbs up... thumbs down... What do you think? Funny sometimes where ideas come from and how easily influenced one can be. 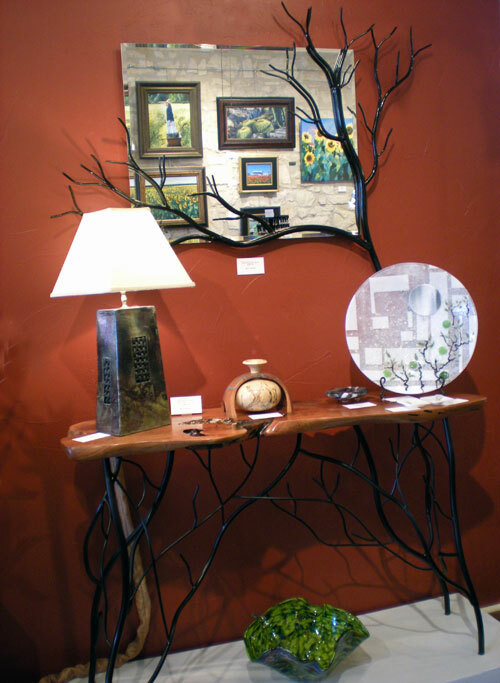 I knew exactly what influenced the image of a full moon but it wasn't until Saturday when Anne arranged my bowl on Barry Bradley's mesquite and iron table Branching Out that I remembered... Suddenly I recalled walking into Artisans this fall, seeing this new series of furniture and being struck by the strong imagery of the branches. I didn't realize how strong it impacted me at the time but seeing these pieces displayed together it was undeniable the influence it had on me.